A New Jersey jury On Wednesday ordered Johnson & Johnson and its main talc supplier to pay $80 million in punitive damages to a mesothelioma victim who claimed he contracted the asbestos-related cancer from years of using Johnson’s baby powder. Capping a 2½-month trial just blocks from Johnson & Johnson’s world headquarrters in New Brunswick, N.J., the decision brought total damages awarded Stephen Lanzo III, a 45-year-old investment banker, and his wife Kendra, to $117 million. The jury last Thursday awarded $37 million in compensatory damages to the couple. About 70 percent of the damages were assessed against Johnson & Johnson Consumer Cos., Inc., a J&J subsidary, and about 30 percent against Imerys Talc America, Inc. In tacking on punitive, or exemplary, damages, the jury found that the companies had acted in willful disregard of the likely harm to Lanzo and other consumers. The jury votes to award punitive damages were 5-1 against J&J and 6-0 against Imerys. The trial in Middlesex County Superior Court was the second involving claims that long-time use of J&J’s talc powders caused mesothelioma. In the first case, tried last fall, a state court jury in Pasadena, Calif., found that J&J and Imerys were not to blame for the mesothelioma of plaintiff Tina Herford. At issue in the Lanzo case was whether Johnson’s Baby Powder contained traces of asbestos, and if breathing microscopic asbestos fibers over years of sprinkling on the powder was a significant factor in Lanzo’s illness. As in the Herford case, much of the trial focused on abstruse testimony and debate over the actual definition of asbestos, and whether trace minerals sometimes found in cosmetic talc were asbestos or something else. As FairWarning reported in January, a trove of internal documents showed that in contrast to public pronouncements, J&J officials privately acknowledged decades ago the risk of talc powders being contaminated by asbestos. In the 1970s, they sought to persuade federal regulators that talc powder containing up to 1 percent asbestos would be safe. During the trial, lawyers for Johnson & Johnson and Imerys insisted that there has never been any asbestos in talc powders, and that plaintiff lawyers and experts had mischaracterized trace minerals as asbestos. They also introduced evidence that Lanzo could have been exposed when asbestos materials were removed from a home he had lived in and a school he attended. But jurors clearly disagreed. 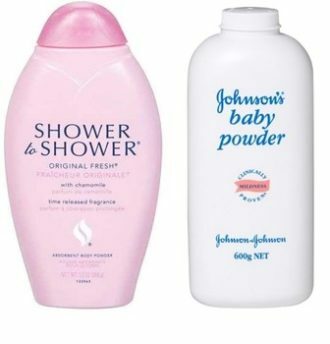 In the last three years, J&J has been engulfed by lawsuits alleging that its baby powder, and a second talc powder called Shower to Shower, has caused cancer. As of Dec. 31, about 6,610 baby powder claims had been lodged against the company, according to J&J’s annual report filed with the Securities and Exchange Commission. No more than a few dozen of these lawsuits involve mesothelioma. The vast majority have been filed on behalf of ovarian cancer victims who allege they contracted the disease from longtime use of talc powders for feminine hygiene. J&J has lost five of the six ovarian cancer cases that have been tried, with aggregate jury awards in the hundreds of millions of dollars. But some of the judgments have been wiped out by post-trial rulings or appeals–including a $417 million verdict in Los Angeles.